2K Sports' award-winning NBA 2K series will debut on iOS mobile devices next week with NBA 2K12 the same day the title releases on consoles and PC. The game will include the popular "Jordan Challenge" that made last year's NBA 2K11 such a hit. CNET reported the story first, with gameplay impressions (and a gameplay video, at the link below). NBA 2K12 on the iPhone will have Quick Game, Season, Playoff, and Situation modes, the latter allowing players to create custom scenarios such as quarter, time left, possession, score and other variables. Season will include player transactions. 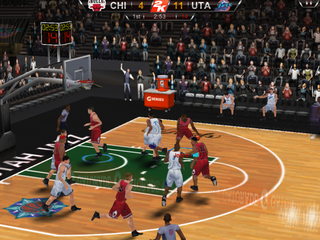 NBA 2K12 will also include GameCenter support and, should the lockout lift, rosters that update throughout the season. The control scheme will include both a virtual gamepad and a "one-finger" mode in which everything is executed with a swipe of a finger. 2K Sports told CNET that it's considering adding more specific move controls once the game releases. When it comes out NBA 2K12 may be the only basketball simulation on the iOS platform. Kotaku reached out an EA Mobile representative (and had yet to hear back as of publication) but it is not believed that NBA Elite will publish another iOS title this year. With the lockout and NBA Elite on hiatus, very likely returning under a different name next year, odds are against it. NBA Elite 11 published for iOS last year, even though the console version was canceled at the last minute. NBA 2K12 is available Oct. 4 and will cost $4.99 for the iPhone and iPod Touch, $9.99 on the iPad.